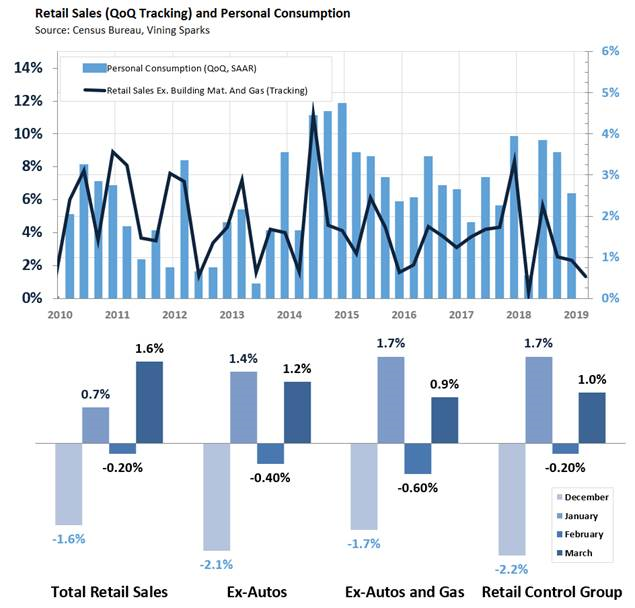 Retail Sales Snapback More Than Expected on Widespread Strength: The recent swings for U.S. retail sales continued in March as the U.S. consumer posted a stronger than expected rebound from February’s slowdown. Total headline sales rose 1.6% in March, easily clearing expectations for a 1.0% gain expected and the fourth largest gain of the cycle. Headline sales benefited from strength in both core and non-core categories, with sales of autos up 3.1% in March (strongest since 2017), sales at gas stations higher by 3.5% (regular unleaded rose 9.9% for the month), and building materials sales 0.3% higher. The core categories rose by a solid 1.0%, more than doubling the 0.4% gain economists had expected. In the details, 12 of the 13 categories rose in March with 11 of those exceeded their 12-month average. The autos, furniture, food and beverage, gasoline, clothing, miscellaneous, and online retailers categories all rose 1.0%. While February’s core contraction was revised down 0.1% to -0.3%, the strength in March leaves the overall trend better than expected and should result in upward revisions to 1Q GDP estimates. Initial Jobless Claims Unexpectedly Set New 49-Year Low: Adding to the optimism stirred up by the stronger retail sales about the health of the consumer, initial jobless claims remained surprisingly strong last week, falling unexpectedly to a new low reaching back to 1969. Initial jobless claims fell 5k from two weeks ago the 192k, the lowest level since September 1969. The recent turn lower in initial claims also dropped the 4-week average by 6k to 201k, the lowest level since October 1969. Continuing claims also improved, dropping 63k to 1.653MM, the lowest since October. The initial claims data continue to highlight persistent strength in the U.S. labor market. Philly Fed Survey Falls Short: The Philadelphia Fed’s Business Outlook Survey for April fell more than expected to its second lowest level since the election. However, in the detail current and expected new orders were stronger and the current employment index improved. However, less pressure on delivery times and weakness in inventories dragged the derived ISM-weighted composite down slightly to 54.6. Later Today: At 8:45 a.m. CT, Markit will release its flash estimates for U.S. April PMIs which are expected to reflect a modest gain for manufacturing and a smaller cooling in the services sector. At 9:00 a.m. CT, the Conference Board will update its Leading Index for March and the Census Bureau will report on February business inventories. Finally, at 11:10 a.m. CT Atlanta Fed President Bostic will join an economic roundtable discussion. Yesterday – Stocks Declined on Health Care Drag, Yields Reversed Overnight Gains Driven by Better Chinese Data: U.S. stocks closed lower on Wednesday as another steep decline for the health care sector offset any positive impact from a WSJ report that the U.S. and China were working towards signing a trade deal in late May or early June. The Dow closed flat after erasing an early-morning jump and swinging between gains and losses several times during the session. The S&P 500 also erased an opening jump to end the day down 0.2%. While tech companies rose 0.6% and several other sectors posted modest gains, weakness in the health care space continued to create an insurmountable drag. The sector followed up Tuesday’s 2.0% drop with a 2.9% slump, marking its worst two-day stretch of the year. The decline began Tuesday after UnitedHealth Group’s CEO said near the end of an upbeat earnings call that political proposals to drastically expand Medicare would cause a “wholesale disruption of American health care.” Such proposals have been gaining steam as politicians have begun building their platforms ahead of the 2020 primaries. As stocks retreated, so too did yields on U.S. Treasurys. Treasury yields had popped higher after Chinese economic data topped estimates, but retreated as risk sentiment soured. The 2-year yield edged down 1.2 bps to 2.40% after adding as much as 1.5 bps overnight. The 10-year yield rose 0.4 bps to 2.59% after rising as much as 2.2 bps. Overnight – Weak European Manufacturing PMIs Pull Global Yields Lower: Global sovereign yields fell overnight after another round of disappointing European PMIs reinvigorated worries about a widespread economic slowdown in the region. Despite better-than-expected services PMI in France (50.5, five-month high) and Germany (55.6, seven-month high), the manufacturing sector continued to contract in April. France’s manufacturing PMI fell unexpectedly to 49.6, a second month of contraction and the weakest level since August 2016. Germany’s manufacturing PMI did rise off of its lowest level since 2012, but by less than expected and the index pointed to activity contracting for a fourth consecutive month. For the Eurozone as a whole, both manufacturing and services were weaker than expected, pushing the composite PMI down unexpectedly to 51.3. Weakness in the EU is one of the key risks the Fed has cited as enhancing its case for patient policy. European yields, which were already down for the day, spiked lower on the reports with the French 10-year down 4.3 bps before 7 a.m. CT and Germany’s 10-year yield lower by 3.4 bps. Treasury yields tracked a similar path, pushing the 2-year yield down 2.0 bps and the 10-year yield down 3.1 bps ahead of this morning’s retail sales data. Fed’s Beige Book Shows No Reason for Fed to Break from Patience: The Fed’s April Beige Book signaled a slight uptick in economic activity, with growth described as “slight-to-moderate” and “a few Districts report[ing] some strengthening” since the March report. However the outlook for “slight-to-modest growth in the months ahead” was little changed. Consumer spending and overall loan demand were described as “mixed,” manufacturing indications were “favorable,” home sales were “stronger,” and agricultural activity “remained weak.” Employment continued to grow across the country and a “tight labor market” had kept upward pressure on wages, although wage gains occurred at “about the same pace as earlier this year.” Prices rose “modestly” while companies’ ability to pass those increases through to consumers remained mixed. Wednesday’s Fedspeak: Philadelphia Fed President Harker (2020 voter) hasn’t changed his outlook in recent weeks, saying again Wednesday that he expects growth to slow through 2019 to around 2% in 2020, inflation to average just above 2% in both years, and as a result “at most, one hike for 2019 and one for 2020.” On inflation, he noted, “my focus is on the medium-term average, and what I’m watching in particular is inflation’s trajectory — that is, not just its direction, but the speed at which it travels.” St. Louis Fed President Bullard (2019 voter) gave a speech that excluded commentary on current monetary policy, but he told reporters afterwards that he expects the yield curve to steepen in the second half of the year as the data recovers. INTENDED FOR INSTITUTIONAL INVESTORS ONLY. The information included herein has been obtained from sources deemed reliable, but it is not in any way guaranteed, and it, together with any opinions expressed, is subject to change at any time. Any and all details offered in this publication are preliminary and are therefore subject to change at any time. This has been prepared for general information purposes only and does not consider the specific investment objectives, financial situation and particular needs of any individual or institution. This information is, by its very nature, incomplete and specifically lacks information critical to making final investment decisions. Investors should seek financial advice as to the appropriateness of investing in any securities or investment strategies mentioned or recommended. The accuracy of the financial projections is dependent on the occurrence of future events which cannot be assured; therefore, the actual results achieved during the projection period may vary from the projections. The firm may have positions, long or short, in any or all securities mentioned. Member FINRA/SIPC.